I’m not sure when the past becomes history. Yesterday? A week ago? How much time has to pass before we call it history? Do you remember Saturday, May 20? I mean, I didn’t at the time think I’d need to remember it. But, I remember it now. It was World Whiskey Day, observed each year on the third Saturday in May. But if whiskey’s not your thing, it was also National Pick Strawberries Day. And, seriously, who doesn’t like strawberries? The Baltimore Orioles won that day, May 20. I mentioned that already, didn’t I? 7-5 over the Blue Jays. Only two teams in all of baseball – Houston and Colorado – had better records than Baltimore on May 20. The Orioles were number one in the AL East. They haven’t been there since. For those of you who wish to gloat, the Orioles are currently 16 games out of first in the AL East behind both the Red Sox and the Yankees. There are just seven games left in the regular season. They are 6-1/2 games out of the second wild card spot with six teams stacked hard up ahead of them. They are not mathematically eliminated from the post-season. Who am I kidding? Stranger things have not happened. 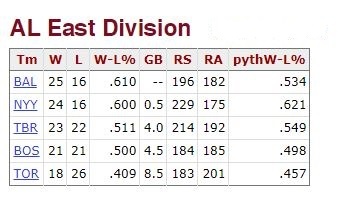 The Orioles spent 29 days in first in the AL East leading up to May 20. What wonderful spring days they were! Sure, their pitching was already hinting at the horrible mess it would become, but the Orioles always seemed just a home run or two away from getting out of any kind of jam. The O’s lost on Sunday, May 21 and again and again and again – a losing skid that stretched seven games. By the time they won again, on May 29, they had toppled to third. When you’re in third place in May you don’t think much about it. You’ve got plenty of time. It doesn’t take much in the early weeks of spring to envision how things might rejigger you back to the top. And, today the Orioles are simply trying not to finish in last. But, just for a moment, let’s remember May 20. On May 20, DJ Khaled’s “I’m the One” was the number one song in the country. “I’m The One” would be number one … for one week. The O’s were number one then, too. This entry was posted in Baltimore Orioles, Baseball and tagged Baltimore Orioles by Jackie, The Baseball Bloggess. Bookmark the permalink. I’m the one who figures that any music video relying on a horde of all-but-naked women to keep your attention won’t win any music awards. Whatever the results in any one season, our favorite teams will always be number one in our hearts. I could not have foreseen ever — ever — including Justin Bieber on my blog. But, baseball is a funny thing, I guess. And, it was that moment when DJ Khaled, Justin Bieber, and the Orioles were all number one together. For just that one day. I found this year to be 1 odd year in baseball. How did the NL west become a race of 3 teams, and 2 that never got traction? Runaway teams in other divisions that were uncatchable. Other divisions that were toss ups…and most still are. The possibilities for wild card playing seem endless. But it sure keeps us fans guessing, hoping and tuned in, because just once maybe its our year! Thanks for a great reflection back! That second wild card spot definitely does exactly what MLB wanted … it keeps a lot of teams in the hunt until the very last days. The Orioles lost last night so they’ve been eliminated, but there’s still some things that need to shake out in this last week of the season!